Yet, we still do struggle to capture and define the phenomenon in a precise manner. Whether we start from the minimal definition of populism as the antagonism between common people and corrupt elites or differentiate more by distinguishing between populism as a political style, a mobilization strategy and an ideology, whether we describe the rise of nationalism as a new or an old problem in Europe, the negative effects on democracy and the public space are obvious. Paradoxically, it seems that the Western and (South) Eastern Europe are facing the same problem – the rise of populism and nationalism and the crisis of democracy. The conference in Podgorica, organized in the framework of the “Think Engaged: SEE ‘Academia in Dialogue’ Series” brought together leading academics, researchers, and practitioners to discuss these rather disconcerting developments. 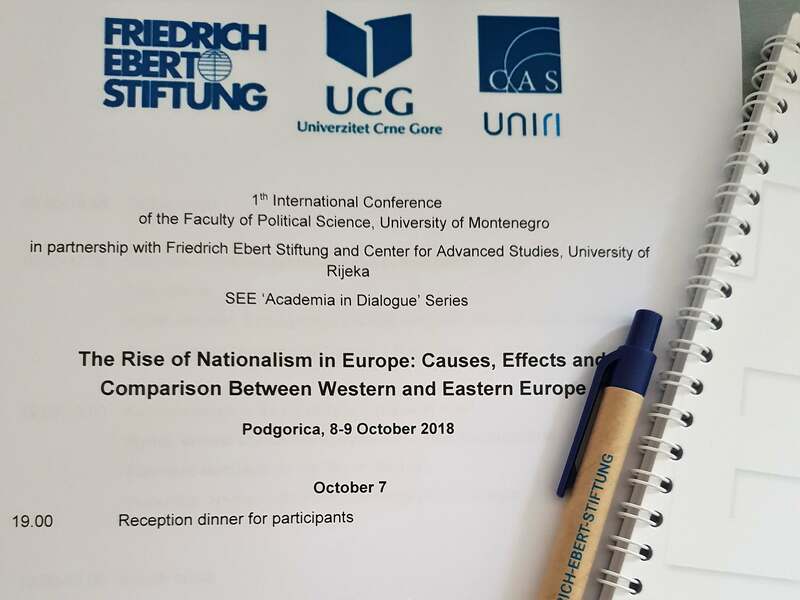 International scholars like Wolfgang Merkel, Reinhard Heinisch, Daphne Daphne Halikiopoulou or Zsolt Enyedi engaged in a debate with regional scholars; global and European comparative and theoretical debates were tested and discussed against the background of specific developments in Eastern Europe and the Western Balkans. The wide range of topics discussed in the conference, be it the question how to define populism and nationalism to debates on the new cultural cleavage between cosmopolitanism and communitarianism or those addressing the “supply” and “demand” side of “new nationalism”, constitute a new and important horizon for further research and political engagement to counter right-wing populism and nationalism. Finally, in the tradition of the SEE ‘Academia in Dialogue’ series, the question of how to bridge the academic debate and the wider public and political debates was raised, outlining possible ways how to both think (academically) and to be/remain engaged in everyday political debates.